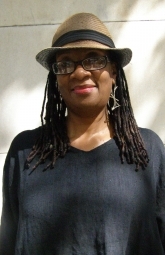 Aquilla Frederick, MBA, MSW, LCSW, is currently a teacher, private practitioner, and writer. She received her MSW from New York University and completed her post graduate training in couple and family therapy at the Ackerman Institute for the Family. She is a member of the teaching faculty, and serves as Faculty of Color Collective training committee representative. She has specific interest in working with trauma in families of color. She has authored and coauthored publications related to race and racism, in addition to producing public access television programs focusing on issues of diversity and treatment modalities in psychotherapy for therapists of color. She co-developed and facilitates a year-long cross racial talk race group with trainees at Ackerman. Aquilla has presented and trained in multiple contexts. Aquilla worked as a psychiatric social worker/family therapist for HIP Mental Health. She maintains a private practice in New York City. Aquilla participated in undoing racism trainings with the People’s Institute and is participating in Ken Hardy’s year-long series on the “Many Complexities of Race”. Before her career as a family therapist, she was an associate producer, and adjunct faculty for CUNY teaching courses in accounting and finance. She has over 18 years of experience as an accounting/financial professional.